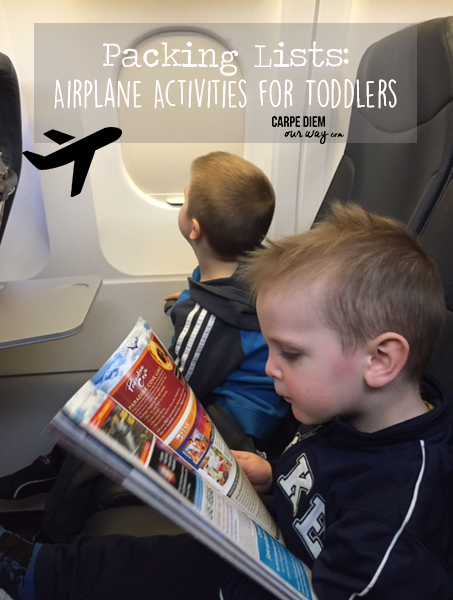 Are you looking for the best airplane activities for toddlers or preschoolers? Do you have school aged children and are looking for some entertainment during your next family holiday. 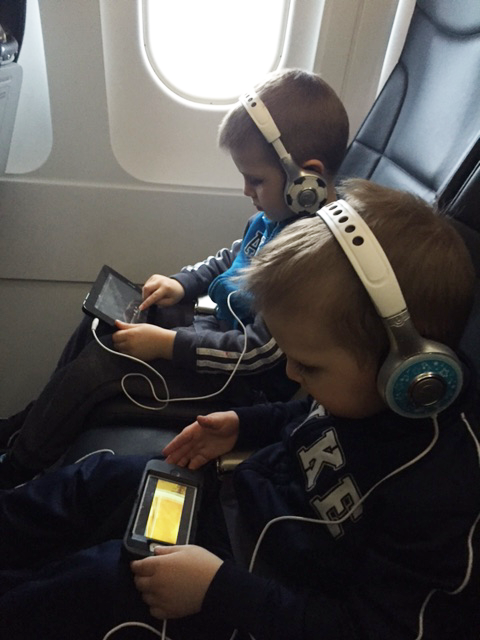 Are you panicking about keeping your littles ones seated and quiet during a flight? You are in the right place! The thought of travelling with young children can be daunting! Do not feel bad if you feel this way, or are intimidated about your first family vacation. How is it possible to get toddlers to sit still for hours on end? Will my child scream the whole flight? How can we survive this? We are supposed to be going on vacation! I know the feeling, I have been there! That is why I have come up with this list of airplane activities for preschoolers and a list of travel activities for toddlers and babies as well as some ideas for kindergarteners and primary school aged children! Below you will find 25 of my favourite airplane activities for toddlers and preschoolers that we have packed for my kids as well as some recommendations from other seasoned traveller moms! When I first wrote this post, my boys were 4 and 2 and we were getting ready for almost 24 hours of travel to fly to Jordan. To say I was worried about keeping them entertained was an understatement! They are now 6 and 4 so I keep adding to the list as my oldest gets older! All of these activities for kids on a plane are also great for car trips, train trips, bus trips and just about any other time you need to keep kids sitting (relatively) still and quiet! After reading this post, check out my review of kids luggage if you are looking for the perfect sized luggage for your kids! 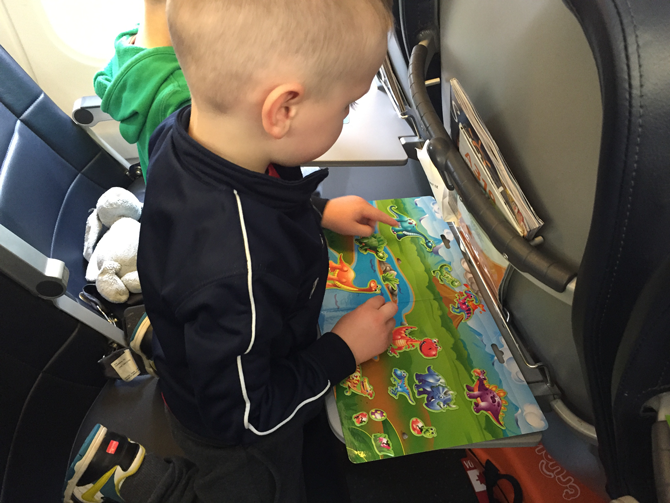 But, read this post on airplane activities for kids first! These are great airplane activities for kids 3 and up! We recently discovered these awesome foam dress up people (and animals) for girls and boys at our local Dollarama store in Canada! They had superhero, princess, dinosaur and animal options! I couldn’t find the exact same thing anywhere on Amazon, but they do have superhero masks, dolls, airplanes, dinosaurs, owls and some other options. My boys did these on our five hour layover in Frankfurt Airport while I half snoozed in the chair. Check out your local Dollarama in the craft section and see if you have foam figures! Michaels might be another place to check. Otherwise you can click on the links above to see what amazon has. You can also get these great magnetic ones but they are not quite as portable for a flight, but would work good for a car trip! My kids have used these before, but honestly, the foam ones were cheap and perfect! Check out these foam Kids of the World ones! Wipe Off Activity Cards! these are almost always in my purse as well as in our carryon when we travel. 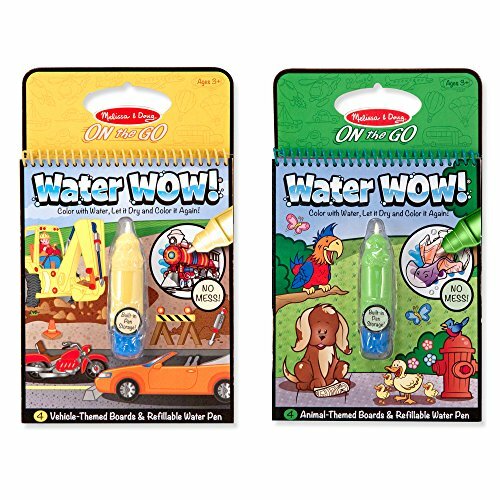 Wikki Stix are a great craft to keep kids busy when you travel! Kids can string beads on these (pack some in a ziplock bag and then ask a flight attendant for an extra cup to avoid messes) and they also stick together. I have only been able to find these on Amazon, but they are great for the creative kid and much less messy than play dough and do not have sharp metal like pip cleaners. They can create 3D characters or shapes or letters! There are all different packs and some come with instructions on making creative designs, but my kids favorite craft is always making glasses to wear! I have a puzzle fanatic at my house, so I always hit up the dollar store and grab a few new puzzles for our flights with toddlers and preschoolers. But check to make sure that the are not too big and will fit on the tray table before your flight! (Yup I have made that mistake too!). These are also great for before the flight if you have an hour or so to wait at the gate. I tend to go with cheap ones rather than expensive ones in case a piece goes missing I do not mind tossing them out and picking up a new one. Sticker books are great to keep kids entertained. They also make great toddler plane activities but you might have to help them get the stickers off the pages. I often let them stick them all over themselves, or me, or a colouring book. There are dozens of options online. Check them out on Amazon. My boys loves these Water Activity Padswhen we travelled. A little bit of water goes inside the pen and they can paint the scene to life! Whether waiting at the airport, or while on the flight, these are a no-mess ideal travel activity for kids. When the pages dry, the picture will disappear and it can be painted all over again! This is recommended for kids aged 3 and up, but it makes a perfect addition to toddler airplane activities as well. Keep and eye out for the triangle shaped crayons so they do not roll off the table. After you bonk your head for the 5th time trying to retrieve crayons that have rolled off the tray table, you will wish you had these! My 4 year old is just learning letters and loves using every single page of a post it note to practice his letters. My 6 year old loves pretending they are trading cards and loves to create each design and then trade them or create a card game as we travel. They are also fun to stick all over everything as a way to entertain a toddler on a plane. Do not cheap out and buy cheap ones. 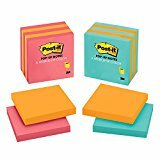 I suggest sticking to the“Post-it”brand. they are only a few dollars anyway, but when I have bought the cheap ones the glue us not good and they will not re-stick or half the glue ends up still on the next piece of paper! The Cubebot comes in many sizes, but we like the micro for traveling with toddlers. This toy has been in my purse for over two years and the boys still love it. They are not easy to find at a store, but you can get them on Amazon. The small ones fit into the palm of their hands and their bendable and foldable design keeps my kids occupied for ages! It also makes a great superhero when needed. Just make sure that you do not lose the instructions on how to make it back into a square! 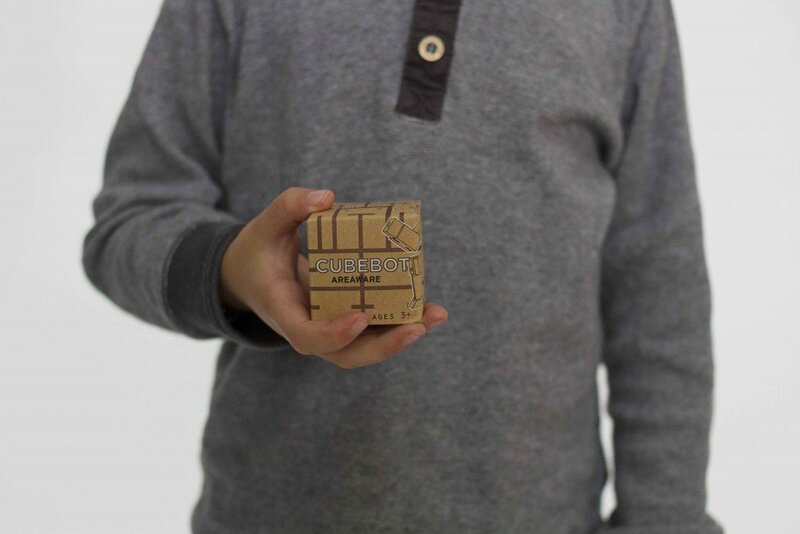 Cubebot comes in lots of sizes, We have the small one and it is not only just a great travel staple, it gets used in restaurants, in the car and even at friend’s houses! I usually grab a pack of plastic animals or figures before our trup and wrap it up. Whether it be farm animals, dinosaurs or bugs, it is something new and fun for the kids to use their imagination. You can get them in a handy tube like the photo above, or check out the local dollar store. I have never seen anything quite like these Imaginetics Magnet Boards. The board opens up and creates a scene with a bunch of characters and accessories that stick to the board! 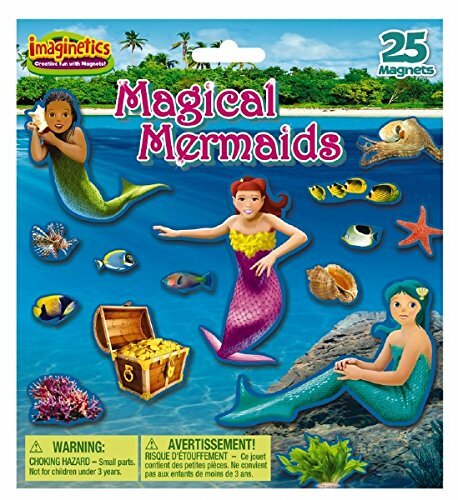 The photo above shows mermaids, but there is also dinosaurs, pirates, ballet, construction sites and lots of other choices for boys and girls. I love that they are less than $10 for airplane activities for kids that can be used again and again! You can check them out here. This is probably my favourite airplane toys for kids and often a gift that I buy for anyone that I know is going on an upcoming trip! There are two sizes of these. The smaller one is more square, where the larger one is more rectangular. Both are fine, but I would recommend the smaller one for a plane or car activity. These are also great road trip activities for toddlers and preschoolers as long as your toddler is not putting them in their mouth as there are small pieces! Markus loves the Magnetic Dinosaurs (and mom loves that they are not always on the floor! 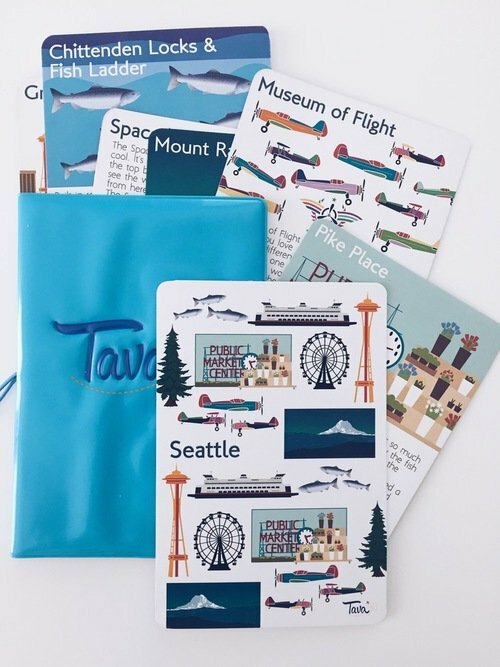 We love the Travel Passports from Tava Adventures. The Passport comes with 10 4×6 travel cards hi lighting your chosen destination in a kid-friendly way! We have the London and the Seattle ones and when we travelled there, I read them to my kids! These can also be for older kids to teach them fun facts about the places they are going! YES we pack the technology! A mum has gotta go what a mum has gotta do! We picked up a $100 tablet and loaded it up with movies that the kids are into and that gives me a break if there is not a seat-back TV. More and more we have come across flights without TV’s (like visiting Oahu from Vancouver) so we always come prepared. I was recently on an overseas flight to Jordan with a screen that would not work, so I always like to have a backup. My 6 year old now plays minecraft on the tablet that we have had for a few years. So it at least has some longevity and you do not end up handing over your phone to occupy them! Get headphones that fit kids. We made this mistake on one of our first trips and bought what looked like kids headphones. While they say fits ages three and up, they ended up being way to big for toddlers! Now we look for headphones designed specifically for toddlers and preschoolers. These ones are great because we have broken about 5 pairs as the kids seem to love to pull on the wires! With the wireless option, this doesn’t happen and they still come with an optional cord to hook into the entertainment systems on the airplane. 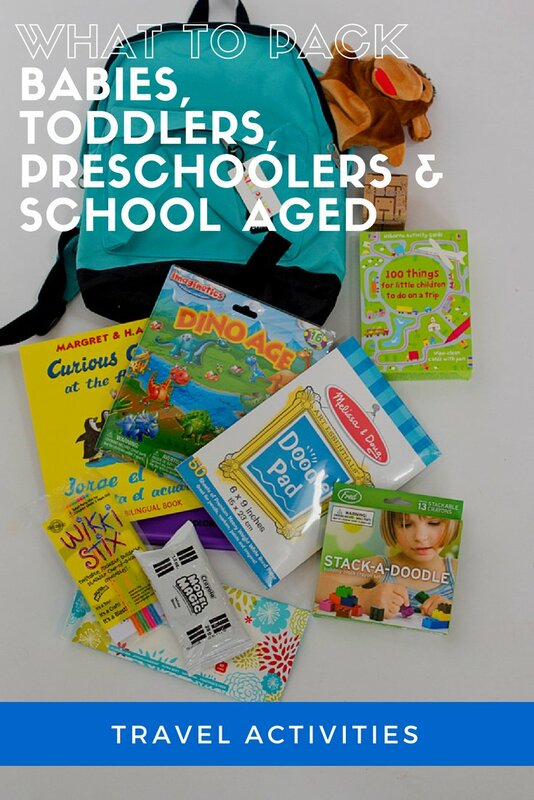 Travel Activities for Toddlers: Yes we pack the iPods and tablets! Lets face it, kids LOVE them! And will love playing doctor and fixing your owes! 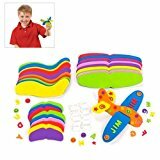 These are inexpensive travel toys for toddlers on airplanes and if they happen to have a scrape or fall, you have them handy! Check outAmazonfor their favourite characters! 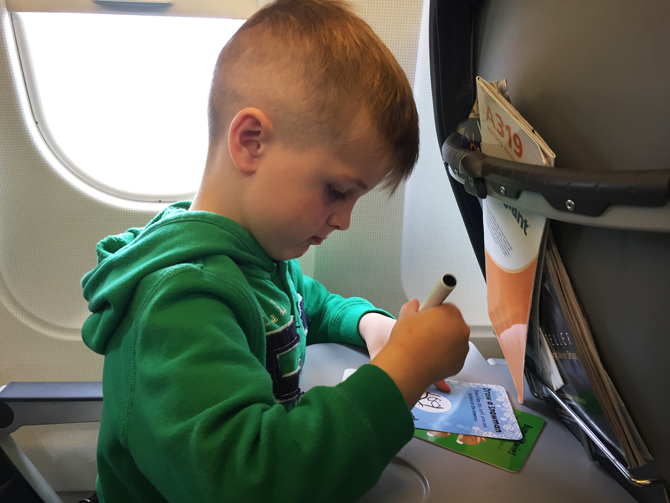 These are one of the popular toddler plane activities that avoids the mess of markers getting on the tray tables! If you have not seen these, they only produce colour on the paper. It Means no marks are left on the tray tables! I have even seen sparkly ones lately! Click here… if you want to see what I am talking about! 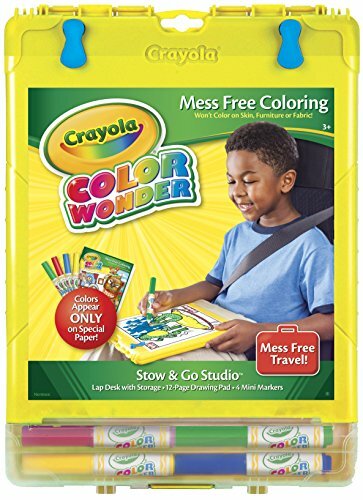 If you have a little one that is into colouring, this is a great travel toy for a 2 year old, when you can’t keep your eye on them for every second, like in the car! They are also great for restaurants and airplanes! My 4 year old happily uses these, as does my 6 year old, even though my 6 year old is a pretty proficient colorer! 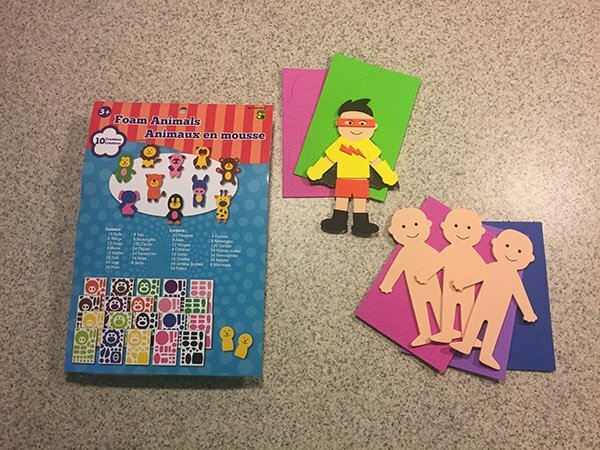 These Books allow children to create a picture one sticker at a time. 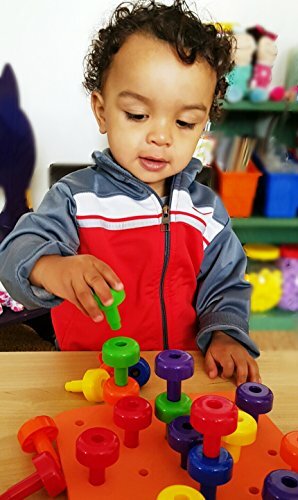 They require fine motor skills so they are not really a great toddler travel activity, but would be better for kindergarten aged children and older. It would probably be one of the popular airplane activities for 8 year old who is into art, or crafts or creating things! It is a good price point at less than $10 for an activity for your child on your next flight! Melissa and Doug is well known for its great toys and good quality items! So many of them make great toddler plane activities! This is one that came up on a recent search that I did and I think it makes a great idea! This one is something I would recommend as one of the road trip travel toys for toddlers that I would pack because it is a bit bulky. Kids love drawing on it and then changing the lights and the neon felts come to life! You ca check it out here or watch the video below! It really is pretty cool and something that kids can use at home as well! 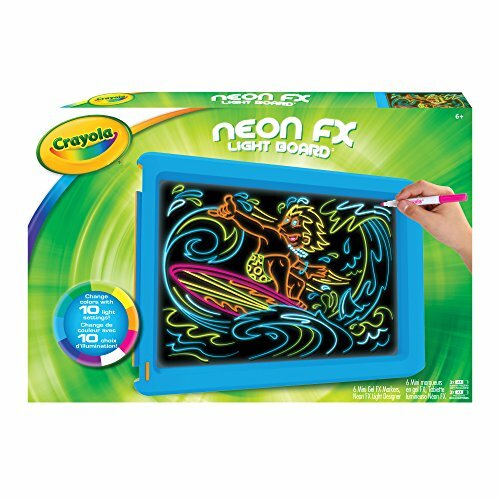 It does say for kids 6 and up, but any kids that are doodling can easily use this! If your road trip occurs in the dark, this is something the kids would have fun with as well. Kids love wrapping up and giving gifts, bring some tissue paper and let them wrap up some small items that you have brought for them to play with and check out the thrill on your face when you open them up! We did this for almost an hour with my 2 year old on our first 6 hour flight! 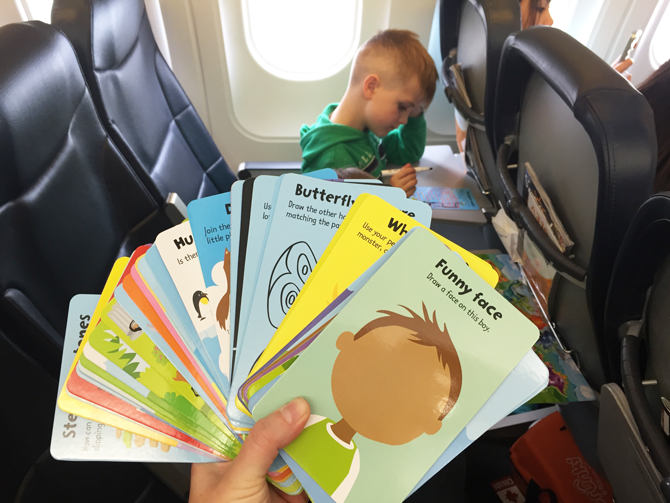 Sometimes, if you want to know how to entertain a toddler on a plane, it is the things we least expect that will be the best! These Activity Books are great for little ones that are into markers and doodling. Similar to the cards I mentioned above, these are better if you want everything in one place and do not want to be playing 52 pickup! They can trace shapes and the markers wipe off. If you get these, try and wipe the marker off after your child is done. It makes it much easier than trying to wipe it off a month later when you go to use it again. The marker is much harder to clean off then! 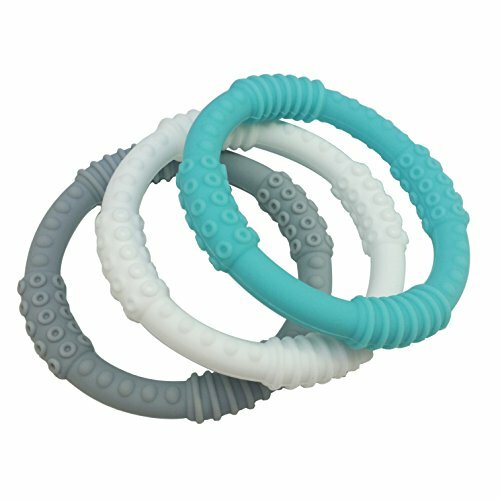 You might already have a teether for your baby. But the ones from Mooi are the best ones I have used. A few reasons: they can go on your wrist when your baby is done with them so they don’t get lost, they are easy to hold with two hands, they make a great sensory object and they are cheap! Grab one of these before your next trip! Once you have one, I doubt you will have another teether leave the house! This is a great sensory rattle to travel with. I like it because it is mostly rubber on the outside and easy to wipe clean when it hits the ground! 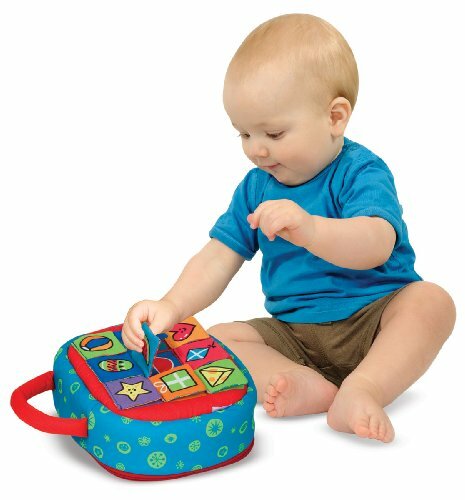 It makes my list of the best travel toys for toddlers on airplanes that still like to chew! These eggs are a popular travel toy for one year olds. But even my 6 year old is happy to play with them when there are little ones around! Again they are easy to wipe clean with a package of wipes when your little one is on the floor with them. Our boys are pretty well travelled kids. Quite often our trips are two legs with multiple hour stopovers. They are often content with technology, but I like to include some travel games for kids as well. We all know that zombie tv-watching child, so at least they can use these while we wait at the airport AND on the airplane. While I do not bring ALL of these travel games on each trip, I pick a few. They are also great at our destination in the evening! We JUST came across this awesome gadget from google. Its called a Google Cardboardand you can download the app from your phone and with their cheap goggles you can explore all over the world! A friend of mine had these and I just ordered them for my 7 year old for our plane trip next week! It brings me back to those things we had with kids with the round film on them and you inserted them into the eyepiece and could see the photos! If only I could remember what they were called! I loved those! Don’t forget a neck pillow for your little one (and yourself)! This one, has a ton of great reviews! Is your bag full yet? Do not forget the snacks when you pack for your kids activities on an airplane. You can read our updated list of list of snacks to pack for your next trip here. You can read all about the best kids carry on luggage here! 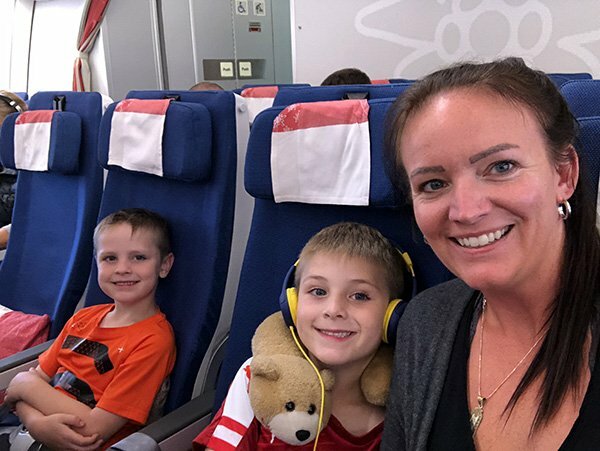 Did I forget something you love to take on a flight with your children? let me know in the comments! You can pin it and save these Airplane Activities for Preschoolers and Toddlers and More! When my kids were toddlers, before they were using iPods or iPads, I brought old cell phones that we were no longer using. They loved playing with those! My daughter is 11 now and has been traveling since she was 3 months old, I remember the days when I had to entertain her. Those stixs were one of the things she loved. Colored pen and paper also kept her busy for a bit. As long as you take one you out a a time and then whip out technology at the end, the flights was always peaceful for all. Great tips here! These are all great ideas and I’m sure enough to keep them entertained and engaged. A few solid idea’s there for the kids. My youngest would crazy with the bandaids. We are lucky our girls are at the age where they are happy to watch the in-flight entertainment or sleep. Baby #1 is on the way and people keep telling me that we won’t be traveling the way we do now. 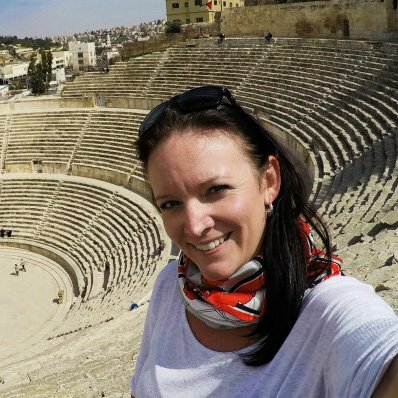 And they are right, it will have to be adjusted, but I can tell you, I do NOT want to STOP traveling just because we have children (in fact, I want them to see the world, too!) I’ve been reading lots about traveling and flying w/ kiddos. For the younger ones, I hear having things tethered down is essential so that pieces, cups, binkies, etc don’t fall into those hard to reach places on planes. Not one but TWO little bundles of high energy trouble and joy to cater for here! I have 2 nephews, one is 5 and the other 8. Going on holiday with my sister I quickly learnt to empathise with the poor mother with the crying baby. But OMG god BLESS technology. The ipad has been a god send! It is so nice when parents actually consider bringing”anythin”g for their children to do so this list is a godsend. I get so mad when kids are just bored and acting up and the parents do nothing about it or get mad at them in return. Too bad they all can’t be like you. Very useful! I’ll forward this to a friend of mine who’s going to fly with her little one soon! Great list. Wiki Stix were definitely one of our favorites when my daughter was younger! Great ideas! I had no idea that triangle crayons existed….brilliant! Also, I really love the idea of wrapping some little things. Makes it all so much more exciting for children! That list is brilliant and the triangular crayons are pure genius! I didn’t even know those existed but will definitely be getting some now! Also like the pipe cleaner and bead idea – ideal for my daughter. Thanks for the great post. Amazing post. 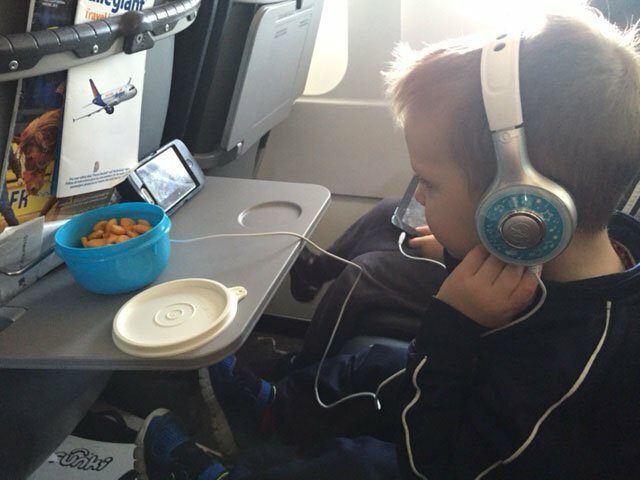 I got various new ideas for keeping my child busy during traveling so that he doesn’t get irritated. I was unaware of the triangle crayons. Keep sharing such interesting ideas through such posts. glad to hear it was useful Kanika!